I’ve recently written a couple of posts on the new certification track for Oracle Applications that has just been released. 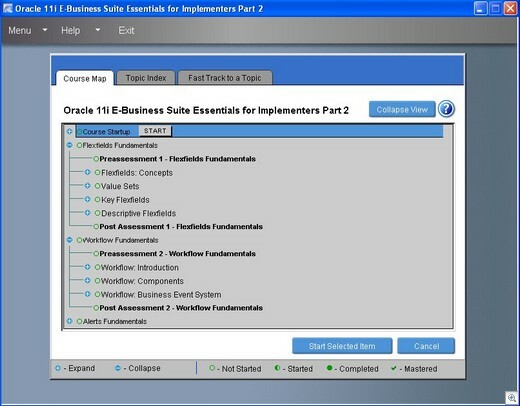 I’ve ordered the Oracle 11i e-Business Suite Essentials for Implementers Self-Study CD Course which is designed for the first exam (Exam #1Z0-200) in the Financials certification track. The course consists of two CD-ROM’s produced by Thomson Netg and wanted to let you know my first impressions of the course material. At the end of each course topic there are self assessment questions which are helpful in determining whether you’ve learnt enough to be ready for the exam. I wouldn’t hesitate in recommending this CD based learning to anyone who wants to learn more about Oracle Financials. If you would like to ask me any further questions about the content please add your comments. BTW, I’m not prepared to burn copies of the CD for anyone so please don’t ask! !